Last Sunday was an ill fest! The b-boys battled hard round after round in Hollywood in the first ever B-Boy Summit Mighty Zulu Kings' "Color Warz Battle" where the losers were not only knocked out of the competition, but had to forfeit their crew colors! There were eight crews battling for supremacy: Renegades (CA), Kadetes del﻿ Toke (Mexico), Raw Muzzle (Italy), LA Breakers (CA), Bits N Pieces (CA), Killafornia (CA), Battle Born (NV) and Furious Styles (AZ). Read on to see who got to the final round. A winning crew member collecting the shirt of their opponent! Presiding over the battles were Asia One and Alien Ness. The tough task of judging was down to Technyc, Skill Methodz crew, DJ Lean Rock (Floor Lords) and Easy Roc (Rock Steady Crew.) You decide if the judges got it right! Watch this for some nasty dancing with a touch of attitude. Did the best crew win? Like Alien Ness said..."they're up and coming." That's why he personally invited them to this event. Old skool breakers from LA battle the new-comers from Italy. "IF you were there, you saw and felt how it went down on Sunday!! It was the battle and performance day! Def got it all in there! Took em to church! 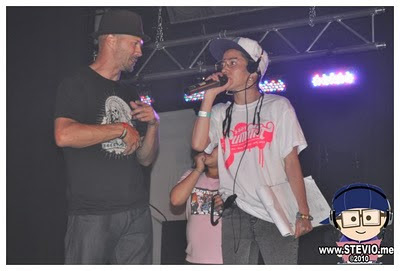 We set it off with She Got Game (Australia) with a dynamic Bgirl Panel, and straight into the 2vs2 battles. The competition was fierce! I had my $ on Bonita and Feenix or Loose Ill and Ill Boogie but when I saw the silver bullet that was Eri and her partner Yama P, The Twisted Sisters (Japan), I knew it was on! Def some hot contenders, a very high level showcase of competitors for all the battles throughout the weekend! Popping beef brought that gangsta element out of all the Funk Styles Competitors! New editions this year are Waacking and House!